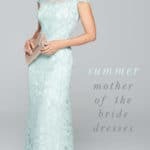 In addition to the main event – and the wedding dress that goes with it — brides need a whole slew of dresses for the events leading up to the big day. 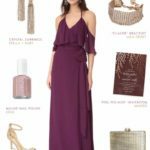 A few days ago I created a look for the rehearsal dinner ( it would work for an engagement party, too) and today I’ve created a look featuring a bachelorette party dress for the bride. Bachelorette parties are a fun time to celebrate the bride, let your hair down, and have your closest friends and bridesmaids out on the town for a little fun and bonding time. 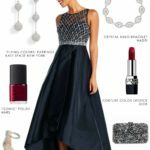 Whether you’re going on a big weekend out like Vegas, or just to a local bar or restaurant, it’s a nice chance to wear a sparkly little number like this. 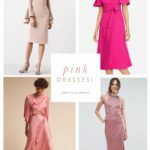 Bachelorette party attire is the perfect time to break out all the dresses that I usually don’t recommend on this blog for wedding guest attire and bridesmaid dresses. 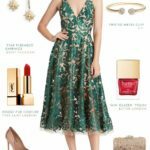 It’s the perfect chance to wear slightly less modest styles ( so long as that fits with your personal style) so a shorter hemline, and a flashy sequined material certainly won’t be out of place at a bachelorette party. I thought this look was ideal for a bride to wear because of that white background ( see my thoughts on little white dresses here!) and the silk and beading – it’s a little bit elegant and a little bit flashy at the same time. I particularly like how the sleeve keeps the short hemline from being too over the top. Since we’re heading into the slower season for weddings, I have the sense that many of the events for next year’s summer weddings are scheduled for fall winter and spring. 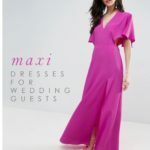 If you’re a bride-to-be who wants a glamorous and fun dress for your bachelorette, I’d highly recommend this one! 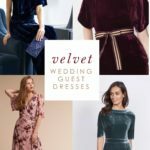 If you’re a guest, I have a few dress ideas for you here, and many more to come in the future! 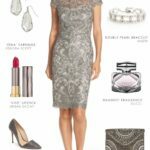 Check out my bachelorette party dress board for many other dress ideas! That dress is the definition of perfection. What a great dress and accessories combination! Love the bling, perfect for the occasion. Wow! Love the dress! And that clutch is the perfect match!